(Bloomberg) -- It’s looking like a good month for investors in the emerging-market carry trade. Having been pummeled in the second quarter as the dollar strengthened and capital flooded out of developing nations, currency-arbitrage returns are turning positive again. Traders borrowing greenbacks to buy the Mexican and Argentine pesos and the South African rand have been especially well-rewarded. 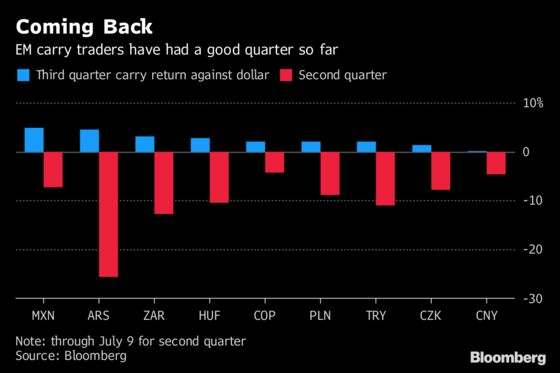 While most carry trades for major emerging currencies are still loss-making this year, their recovery in the past week could be a signal that fears over trade wars are ebbing and that central banks in developing nations are winning back the confidence of investors. Mexico raised its key interest rate to the highest level since 2009 on June 21, following similarly hawkish moves from Argentina, India, Indonesia, Philippines and Turkey. Others, including South Africa, Brazil and Russia, have signaled that they’re ending rate-cutting cycles or are prepared to hike rates if their currencies come under more pressure. The Bloomberg Dollar index has dropped 1.4 percent from a one-year high on June 27, further boosting emerging-market currencies. Investors are pricing in more good times in some cases. 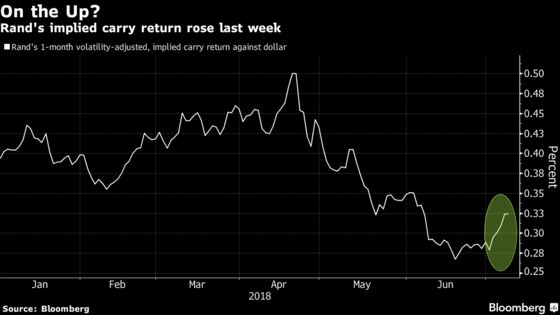 The rand’s implied carry return over the next month, adjusted for volatility, posted the biggest gain in a year last week and is now at the highest since early June. Implied carry returns are on the rise because price swings are moderating. The J.P. Morgan Emerging Market Volatility Index fell last week by the most since March 9. Some global banks are also turning more bullish. Citigroup Inc. on Monday cut back long dollar positions against the rand, Polish zloty and Hungarian forint. Credit Agricole CIB said that clients should start buying China’s renminbi. “We believe the dollar could retrace a little more as global portfolios try to replenish some emerging-market longs,” Citi analysts including David Lubin and Luis Costa said in a note.